The regulation of vasoreactivity by local metabolites is a key mechanism to ensure adequate blood flow so that adequate O2 are supplied for the needed tissues and metabolic wastes are timely removed. Many metabolic factors may participate in the regulation of vascular activity such as local Po2, Pco2, pH, K+, adenosine, and lactate. 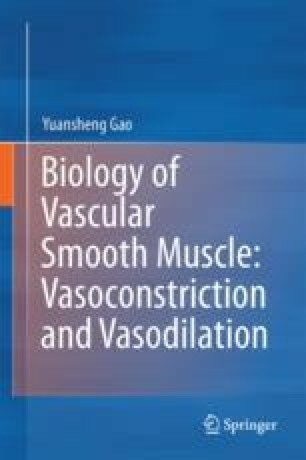 These metabolic factors affect vasoactivity either by directly acting on vascular smooth muscle cells (VSMCs) or by acting on the endothelial cells, resulting in altered cytosolic Ca2+ level and Ca2+ sensitivity of myofilaments in VSMCs and thus altered vasoactivity. For a metabolic factor to be involved, it must be released in a sufficient amount from the tissues and diffuse to the nearby vasculature. Since the formation and release profile of metabolic factors vary under different conditions, their relative importance in affecting vasoactivity varies under different conditions. Under most conditions there appears no single factor that is indispensable for the metabolic regulation of vasoactivity. More likely this process is regulated by multiple factors in a redundant manner. Such a concept is exemplified in exercise-induced vasodilatation in skeletal muscle.